Solid waste consists of municipal waste, biohazard waste, industrial waste, and biomedical waste. Given the ever increasing population of the world, it all adds up to a gigantic collection of waste materials that end up polluting the land and the water bodies. While the developed countries do have a system in place to deal with most of their waste products, the problem is monumental in the poorer nations; usually, the population is usually huge and the resources to manage the huge amounts of waste generated are not enough. This, along with the fact that the earth houses a primarily industrialized civilization, has today created the major issue of efficient solid waste management. Yet, in order to ensure that the world remains a livable place, solid waste management has become a priority. Let’s find out why. This is, of course, the biggest motivator behind solid waste management. We human have polluted the earth enough to ensure that it is becoming impossible to find a clean place to live in. In poorer nations like India, it is a common sight to see huge garbage dumps festering in the open. Little to nothing from it is incinerated and recycled, while the rest of the lot is just left there to rot in the sun and rain. Keep in mind that these dumps are present right in the middle of civilization, which means there is habitation all around it, with people and animals living around the filth and rubbing shoulders with an incredible amount of germs. Proper management of this waste will give these people and animals the chance to live a cleaner, healthier life. All water bodies around the world have become extremely polluted, be it the oceans or the rivers. The primary contributor to this pollution is of course industrial advancement; most industries channel their wastes into nearby rivers or seas. A lot of this waste product dissolves and becomes a part of the water, rendering the habitat of marine life completely toxic. Each day, hundreds of aquatic creatures die due to this toxicity, and several thousand more are forced to evolve to adapt to such drastic changes in environment. Scores of marine species face extinction solely due to water pollution. Marine life is one of the primary sources of nutrition for most of the world, and the rivers and springs are the only sources of getting water for drinking. Water pollution has led to fish and other aquatic species into imbibing a considerable amount of metals and other elements, like lead and mercury, which have in turn become too toxic for human consumption. Water pollution has also made it more difficult to source drinking water from usual sources; sometimes, it is way too toxic to be purified completely, leading to deadly diseases like cancer on consumption. A great way of managing solid waste, especially biological waste, is to use it as landfill or compost. This can be done by agricultural industries, and also on a micro level by individual households. By composting biological waste such as stale food, plant and animal matter, and even human and animal feces, it would be possible to create a great growing environment for plants. If each household grows a couple of plants in their terrace or garden by using their own kitchen waste as compost, the world would be a much greener, and healthier, planet. It need not be said that a greener planet will translate to cleaner air and decrease in the effect of global warming. As the air and land becomes more and more polluted with the waste generated by the human population, collective health keeps deteriorating. Each person and animal is today more susceptible to diseases caused by pollution, which has led to monumental healthcare costs. By ensuring that solid waste is managed properly, we will be able to considerably bring down national and individual healthcare costs, and give ourselves a healthier and longer lifespan in the process. In the absence of solid waste management, the world will rapidly transform into a huge garbage dump. 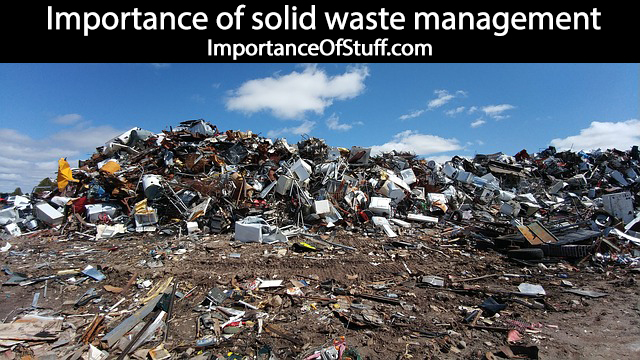 The methods of management are many: recycling, composting, and incinerating. But first, education is important. For instance, people need to be educated about recycling and proper disposal, so that non-biodegradable items like plastic are reused and not littered willy nilly everywhere. Industries need to channel their wastes, and not spill it into rivers and the seas, which poses serious threats to the marine population. It is important to remember that by not managing our solid waste, we catapult the human race and all other animal species into the mouth of extinction.